We are living in unsettling times. We are friends, family, neighbors, classmates, teammates, and citizens, each day navigating life’s routine challenges, and at the same time trying to make sense of loss and grief born from natural disasters without precedent, and horrific acts of violence at home and around the world. That said, often lost in the news of the day is that with each day that passes, another day is added to the accounting of this nation’s longest war. In that regard, many have argued the greatest threat to our nation’s volunteer military comes when the stories of service and sacrifice – representing those who have shouldered the burden of each of this nation’s wars – become ‘old news.’ Even worse, it’s when those stories are appropriated by others, for ends inconsistent with the ideals of service and citizenship that have motivated so many of America’s sons and daughters to military service. Today – Veterans Day – is a day to tell those stories. It should not be the only day. However, it is the day when our fellow citizens are most likely to pay attention. The point is, on this day, those telling the stories of our veterans had better get it right. In that regard, who better than our veterans themselves? This is why for each of the past six years, the team at the IVMF has taken Mr. Horner’s call to action as our charge. In the last six years, in the weeks approaching Veterans Day, many of the IVMF’s veteran employees volunteer to spend a day with sixth graders at Morgan Road Elementary School in Liverpool, NY. One consequence of the all-volunteer force is a great many Americans – and a great many sixth graders – don’t have family members, or even friends of family members, who have served in the military. This fact means what they know of veterans and military service likely comes from the movies or the media. In other words, stories appropriated by others, often told for ends inconsistent with the values and ideals of those who lived the experiences first-hand. 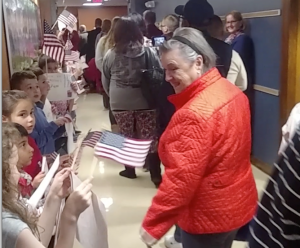 At Morgan Road Elementary, the IVMF’s veteran employees are paired with a student who is otherwise distant and disconnected from the military service experience. The students are encouraged to ask questions about military service, and our veteran teammates are encouraged to share freely and candidly…the good, the bad, and the ugly. 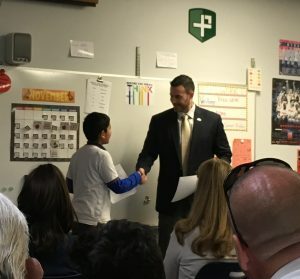 The students then turn that exchange into an essay on the meaning of military service and sacrifice – and the meaning of Veterans Day – told from the combined perspective of a sixth grader, and a veteran. It is a sight to see when the student, veteran in tow, stands up in front of the class and reads that essay aloud. Over the past decade, the number of Americans willing to consider military service has been in steady decline. In fact, today less than 10% of high school students indicate they would consider volunteering for military service after school. There are many reasons for this decline, but in part it’s the result of the fact that, more and more, our veterans are anonymous, while among us. This is because a small minority of Americans have shouldered the burden of our current war – the nation’s longest war – on behalf of the majority. Some of us know these men and women well. Others don’t know them at all. For those in the latter category, it’s important those who have served help the otherwise disconnected and unaffected to understand that. In spite of what politicians or media pundits say – our veterans didn’t choose to serve and go to war for a political party or an ideology. Instead, they served and sacrificed for their neighbors, their teammates, their teachers, and for their families. They served for their follow citizens to include those sixth graders at Morgan Road Elementary. And what did those students learn from the experience? They learned the best gift we could bestow upon our veterans is to ask them to tell their stories, because this is how we honor their service.